For the past three days I have been acting as a so-called student ambassador during an Easter residential science masterclass. 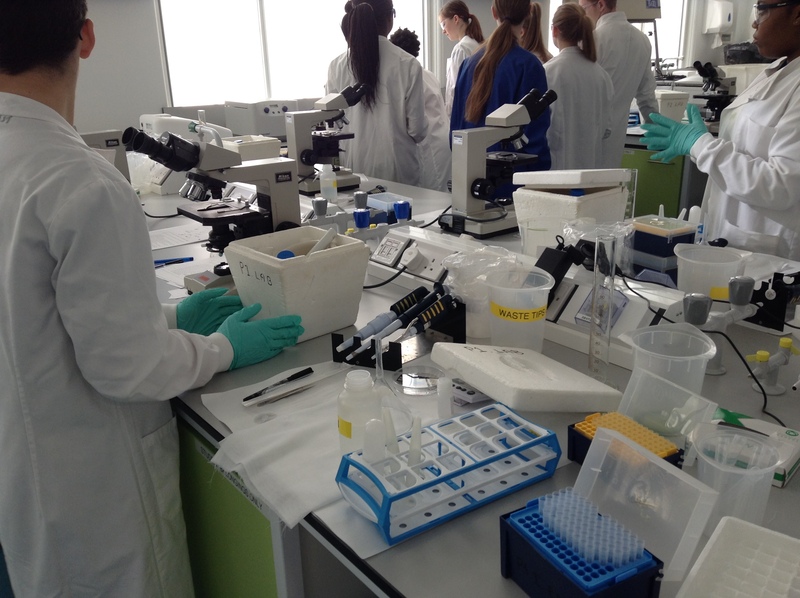 This was a programme aimed at 14- to 16-year old students (about to take their GCSE exams) from across several areas of England, including Bedfordshire, Leicestershire, Northamptonshire and Southwark (London); the students stayed in Pembroke College accommodation for two nights and participated in a range of scientific activities. The students from these “link areas” were nominated by their teachers and attend schools that may not have particularly strong connections with any universities, and Oxbridge in particular. The idea of these Access and outreach programmes is to encourage students from less privileged backgrounds to consider applying to university, including Cambridge. In part this is achieved by showing them that Cambridge is not only for posh, rich, upper-class students (although they do also exist). We started the masterclass with a tour of Pembroke College – did you know that the college was founded in 1347, but did not admit women as members until 1983? Or that one of our most famous graduates, William Pitt the Younger, became Prime Minister at the age of 24? Or that there are 116 libraries scattered around Cambridge? Next, there was a treasure trail through the historic city centre – although “treasure” might have been a misnomer depending on your inclinations, since each station consisted of working through a maths problem. We saw Newton’s apple tree outside Trinity College and The Eagle pub, where Francis Crick and James Watson allegedly had the insight into “the secret of life”, the structure of DNA. [We discussed the contribution of Rosalind Franklin, of course!] Dotted in between all these activities were various brainteasers, such as trying to solve the Monty Hall problem or Einstein’s puzzle (have a go – they are surprisingly fun). The day was rounded off by a talk on higher education, a formal dinner (juice instead of wine) and an evening with Sir Isaac Newton. However, the most striking point was really that the English secondary school education system can be extremely restrictive: if you want to apply for a science degree at university then essentially you have to take only science A levels; a girl asked about whether she could combine science and drama, but essentially she was advised against it and that was a slightly heartbreaking moment. On the other hand, choosing only science subjects means you can focus more and maybe gain a deeper understanding of those few subjects, but should that really happen at the expense of other interests? And at such an early age? Overall, the students on the programme were really a pleasure to supervise – asked interesting questions, engaged with my questions, had a good sense of humour – and made my first teaching experience both exhausting (in a good way) and enjoyable. This entry was posted in Factual, Opinion and tagged biology, Cambridge, Careers, Chemistry, education, outreach, Pembroke College, teaching by Victoria Wang. Bookmark the permalink.